Havelock is a picturesque natural paradise with beautiful white sandy beaches, rich coral reefs and lush green forest. This place is ideal for Beach-combing, sunbathing, scuba diving, seawalk, snorkeling, watersports, surf riding, swimming, game fishing, watching the sunset or sunrise, elephant ride, bird-watching, trekking, sailing, kayaking and many more. Radhanagar is the most famous beach in Andaman. This beach has consistently been classified as one of the best beaches in Asia. 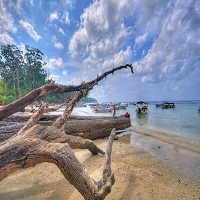 Kalapathar Beach is located in one corner of Havelock Island surrounded by dense forests and excellent for secluded seekers and guests looking to do a bit of bird photography. Elephant Beach, which is located about 10 km from the market, is one of the most popular beaches on Havelock Island for daily excursions. Access to this beach is a hassle-free issue as it can be accessed either by 30 minutes hiking on the forest path or by choosing to ride a boat for one hour.